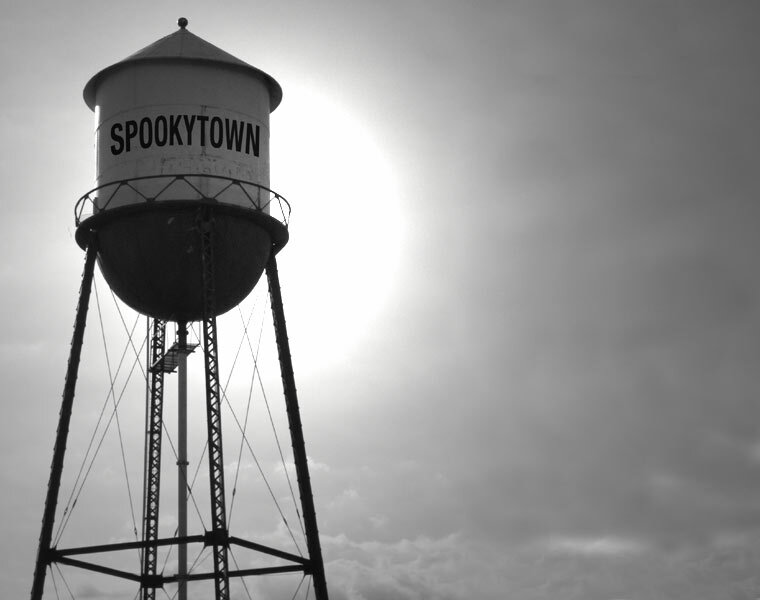 Welcome to the online home of Spookytown. This is only a temporary one-page site I threw together just have information available for the book while I’m actually working on it. 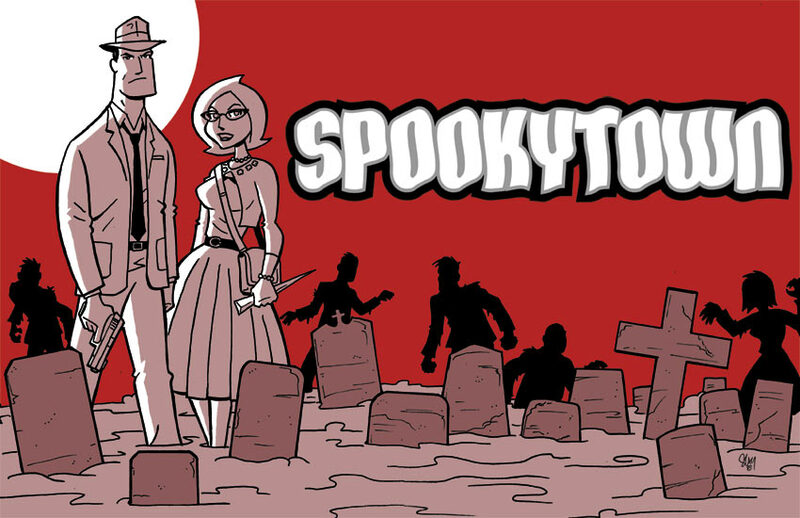 Spookytown is a graphic novel I’ve written, which I’m now in the process of drawing. In Spookytown, you’d swear every day was Halloween. It’s always a little dark and ominous and you never know what’s lurking in the shadows. Almost every place is haunted, the moon is always full, every cat is black, there are graveyards around every corner and it's filled with odd and mysterious citizens. Werewolves, vampires, demons, mummies and various other creatures and monsters make up a large part of the population. 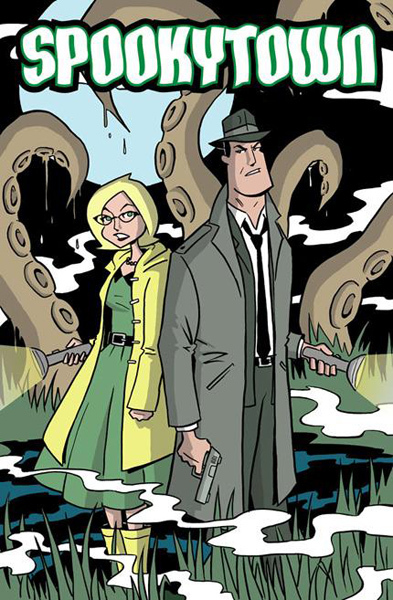 Jack Brannon and his plucky assistant Emma, run Gum Shoe Investigation, specializing in supernatural cases, which seem to be the only type in Spookytown. Business is good for two reasons...he’s the only private eye in town and there is no shortage of dark and dangerous cases in a place like this. Its Phillip Marlowe meets Buffy and the X-Files, mixed with a bit of Scooby Doo and Kolchack the Night Stalker. I'd been calling it "Horror Noir" because originally the style was going to be all from the 1940s. But while writing the story, I mixed in some 50s and early 60s stuff too, like a Tiki bar, a classic diner and 50s style movie theater. 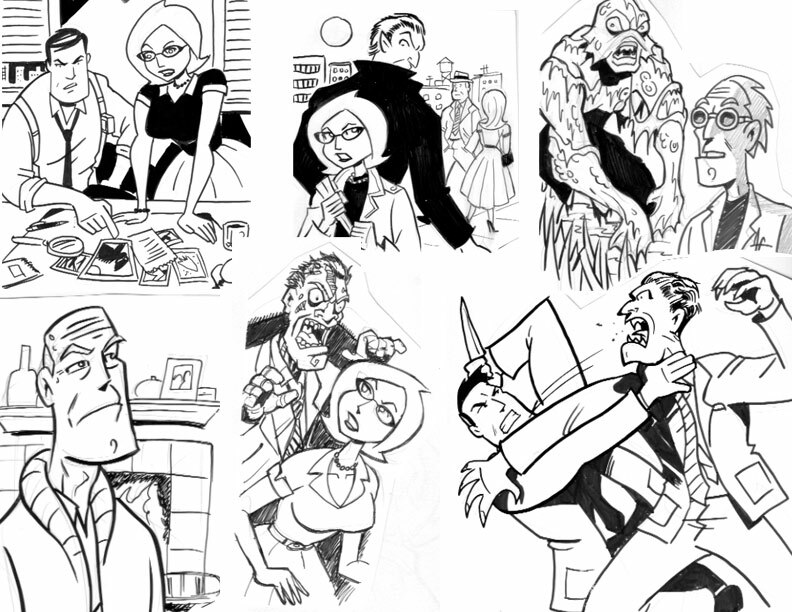 My name is Cal Slayton, I'm a Graphic Designer / Illustrator and sometimes I'm a Comic Book Artist. I'm best known (if known at all) for my work on the hit indie series "Shades of Blue". My artwork has also been seen in Dead@17 Rough Cut, Super Hero Happy Hour, Digital Webbing Presents, Champion of Children, Potlatch and more. In 2002, I came up if the idea just to have something of my own to work on after "Shades of Blue". I published a mini-comic that layed the concept and introduced the two main characters. After that the idea just sat around for about 5 years before I dusted it off and decided to write a graphic novel. I've made the original mini comic available in a pdf format, if you've never read it and are interested in it. But beware, as I say in the back of it... I am not a writer. So, try not to judge it too hard. If you want to check it out, just click here to download it. Well, after I have it ready, I'll shop it around to various publishers to see if anyone is interested in it. If no one is, I'll publish it myself gosh darn it. DO YOU HAVE ANY PREVIEWS OF THE BOOK? 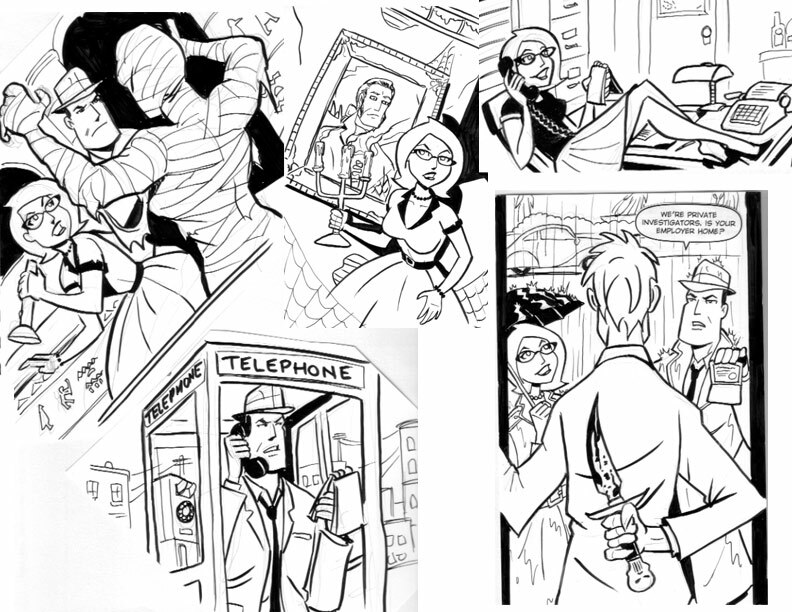 I published a sketchbook in 2007 (seen below) . It’s a 20-page mini-comic type book containing over 70 sketches, drawings and doodles that I’ve done will preparing to start the graphic novel. I printed up a limited edition of 100 books. Each is hand numbered and signed, I usually do a sketch on the back too. Just drop me a line if (contact [AT] calslayton [dot] com) if you'd like to buy one, they're just 5 bucks. 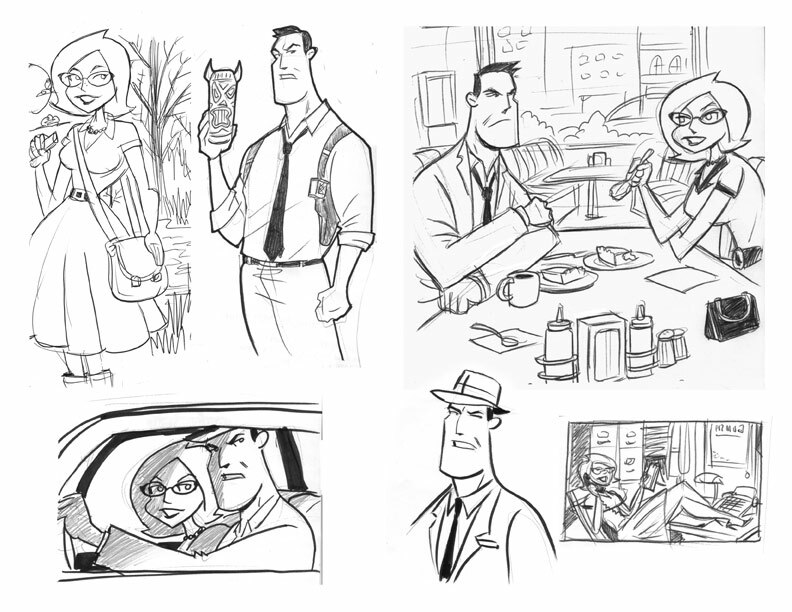 I've posted some sample sketches below. 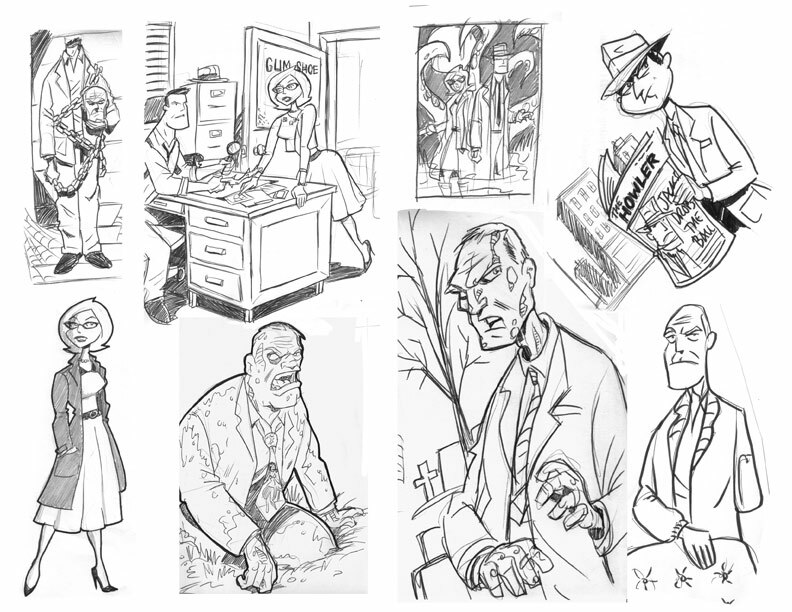 THESE ARE MORE RECENT SKETCHES NOT APPEARING IN THE SKETCHBOOK. 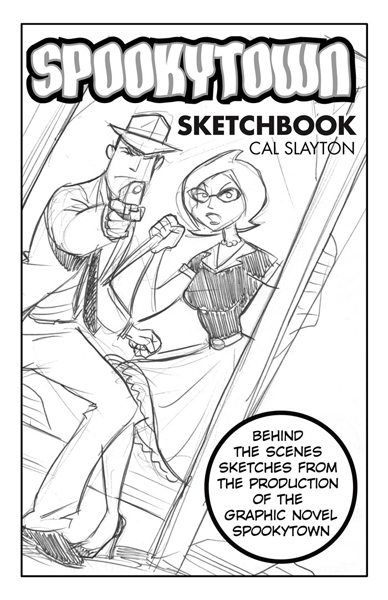 After the Graphic Novel is published, I plan to put together an all-inclusive sketchbook with behind the scenes stuff. © The Spookytown Screamer. Used with permisson.